Aruban cucumbers are small, spiny and spherical and don’t fall apart during cooking. 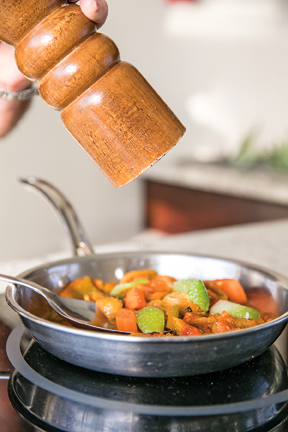 You can sometimes find them at Aruban grocery stores or specialty stores at home, but you can also use zucchini or eggplant as a substitute and cook them for less time, notes Marc Giesbers, the Food and Beverage Director at the adults-only Bucuti & Tara Beach Resort. This dish is served with seared red snapper on the Elements dinner menu, but it’s just as good served with rice – a version that Giesbers uses in the resort’s weekly cooking demo as part of its wellness program. The low-calorie dish is light but incredibly satisfying, with a touch of bitterness from the green peppers, sweetness from the tomatoes and potatoes, and earthiness from the nutmeg. In addition to vegan options like this dish, Elements Restaurant offers sustainable seafood like lionfish and local lobster, when available. “There’s no need to fly-in Maine lobster or Dover sole,” says Giesbers. The resort itself is also a LEED Silver property, the first certified carbon neutral resort in the Caribbean. It was named the “Most Sustainable Hotel in the World” in 2016 by Green Globe. Enjoy this dish at home or on Elements’ beachside patio, complete with a stunning sunset view – or book a six-course private dinner in one of its palm-roofed cabanas directly on the white sandy beach. Wash the cucumbers and remove the stems. Cut them in half, cut out the seeds and chop each half into 4 to 6 wedges. Place in a bowl. Sauté the onion, green pepper and garlic in olive oil until brown. Add the tomato paste, chopped tomatoes and vegetable broth. Simmer for at least 15 minutes. Add the cucumber and potatoes and simmer for 20 additional minutes. Add salt, pepper and nutmeg to taste. Serve hot with basmati and wild rice. Giesbers says you can use any rice you like to accompany this dish, but wild rice adds a delicious nutty flavor. At Elements, he uses a basmati and wild rice blend and seasons it with a little oregano, salt and pepper.